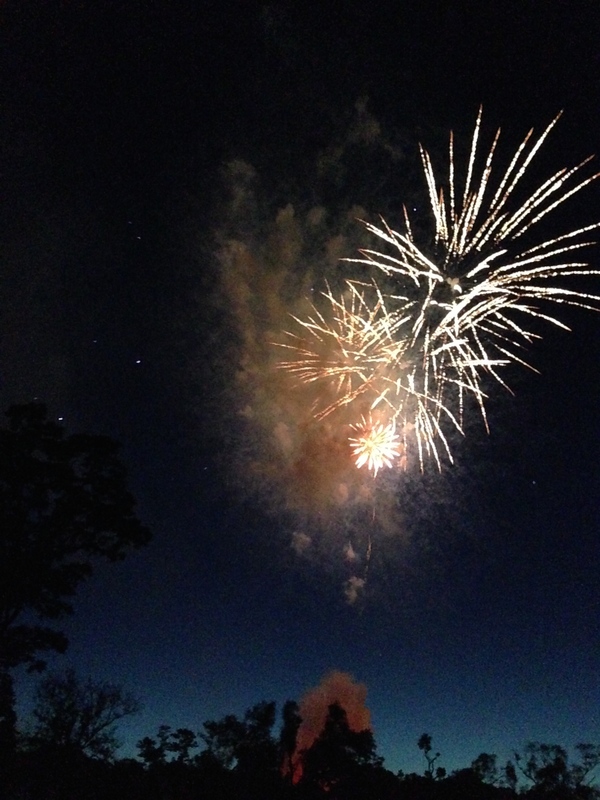 Last evening Katherine and I enjoyed friends and fireworks in a Baltimore bedroom community known as Catonsville. Throughout the year this community raises money for the dual purpose of a local charity and for the sake of the Independence Day (July 4th) celebration. The production is spectacular. However due to an off-shore hurricane, a cool, windy evening made for a different kind of experience this year. Throughout the event, the heavy cardboard casings, often still on fire, fell where we were sitting. Twice I helped extinguish small fires, and at one point a burning ember settled on our blanket! Actually, it resulted in one of the most exciting fireworks shows we have ever been to. As we drove home, Katherine and I laughed, saying that the scene looked like one of those ‘end-of-the-world’ movies where fire rained down from the sky. Later I thought, what if it were the end of the world? I have found it easy to get lost in fear whenever I divide the value of my life by a short lifespan, when all along Jesus asserts that He is making everything new (Revelation 21:5), promising that this life is no less than a leg in an indescribably beautiful eternal journey. Fear can be so dehumanizing, and our only hope for enjoying this life is to be shaped by the promise of what Jesus has secured in the resurrection and in what He is doing until He returns. One day the world will end, (though hopefully not tonight! ), but on our best day, this isn’t as good as it gets, and in God’s good world, Love always trumps fear (1 John 4:18). So for now, we share in the very thing Jesus is doing until that day arrives. Nice… Reminds me again that often times fear is the enemy. Caused me to think that even if this is “as good as it gets”, “the best is still yet to come”‘….. but this is pretty good right now. I always appreciate a good line from a movie or a quote. A movie and book lover…what a fun-relevant combination. How did you make that concert clip show up in your blog? I am new to reading blogs and leaving comments. Mike – At the YouTube site for the video, under the video there is a button called, ‘share’ – if you click on that, there is an ’embed’ button – click on that and then click the embed code, and you can post it. Thanks Mike, glad I found your blog. Good stuff. We make the faith more complicated than it needs to be. Thanks for the reminder about what is important and God’s long term plan…and thanks for taking time with me way back when. Hey – Great to hear from you, Randy! And I couldn’t agree more – the Faith is beautifully simple and the Father delights when His children lives it out simply. It was great spending that time with you – please give Barbara my best. You are currently reading the End of the World at unfinished1.